I’ve been check out Wall Street Survivor this past week. Wall Street Survivor is a free fantasy stock market game where you get to trade real stocks in real time using a fictional $100,000 account. Basically you can use the site as a “paper portfolio” to practice trading stocks. I highly recommend that beginners utilize these stock trading simulators for at least a few months before investing real money in individual stocks. 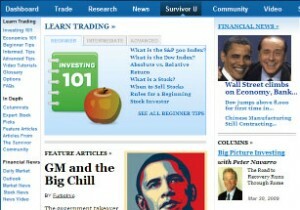 However, Wall Street Survivor.com is not just a mere stock market simulator. It is an active social community that provides a variety of learning tools and some attractive prize incentives to keep you motivated. Wall Street Survivor is giving out over $100,000 in prizes to their top players this year. The site is currently giving away 2 flights to Mexico for the top trader and the top investor of the month. I like the way investors with less than 15 trades have their own prize category. In addition to these top monthly prizes, there are Amazon gift certificates for the next nine runners-up in each category. There are also weekly prizes for the more active traders, starting at $200 for the top trader and down to a $25 gift certificate for the 5th place finisher. Finally, the site also gives out a random $25 gift certificate each day. If the prizes are not enough to motivate you, you also earn points for different activities and those points are redeemable for gift certificates. Wall Street Survivor is also packed with educational content. This Survivor U includes basic, intermediate, and advanced trading lessons. There are also feature articles and regular columns. One column is even focused on dividend investing, so it is not all about trading. The goal of Survivor U is to eventually help members prepare for managing their own real-life stock portfolios. The other main feature to prepare you for your own real portfolio is the real time streaming simulator. The trading area allows you to invest your $100,000 portfolio in stocks by making market orders, limit orders, stop orders, and shorting. The orders can be good for the day or good till canceled. It also appears they you will soon be able to also trade options. I look forward to that feature, since I’m trying to learn more about options trading. In the trading area, you get most of the standard brokerage account views including, open positions, order history, transactions, account balance, and watch list. I like the way trades are restricted in realistic ways. You can’t trade more than half the actual volume of the stock for the day. I tried to buy shares of a micro cap stock today, and the trade didn’t fill because of lack of volume. While this is annoying, it is also realistic. 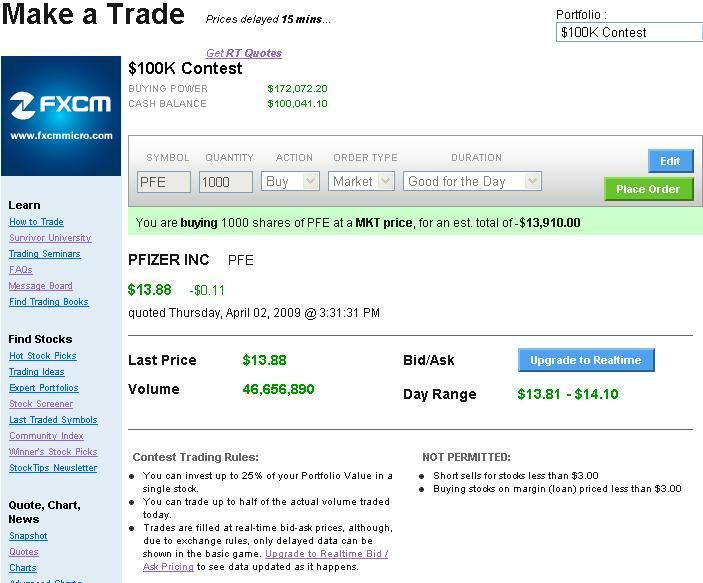 I did finally make one trade for the large-cap stock, Pfizer (PFE), and the order went through almost instantly as it would in the real world. Interestingly, the trading interface warned me that I could only buy up to a certain number of shares. I think it is a way to restrict members from purchasing more than 25% of their portfolio in one stock. I think this is a reasonable limit to keep the contest realistic and fair. Members are also restricted from trading pink sheet stocks, mutual funds, futures, or bonds. I’ve found many good opportunities in pink sheet stocks, so I was a bit disappointed in that restriction but it is probably not an area for beginners. As a special situations and value investor, I also appreciate that most stock splits, dividends, and other corporate actions reported by the news wires will be accounted for in player’s account. According to the FAQ, these situations may cause account values to be misrepresented until the reconciliation occurs, but that also occurs in my brokerage account. Finally, I’m just starting to explore the rich social networking capabilities of the site. These include buddy lists, profile pages, and forums. You can check out my fatpitch profile if you are looking for a buddy on the site.